We conclude this chapter, perhaps not inappropriately, with our comments upon an incident which Price described on p. 284 of EBR as 'The Last Phenomenon?' [sic]. We have here a final accusation of flagrant mis-representation against Price, and a further example of that conflict of evidence which ... is repeated many times in the Borley story. 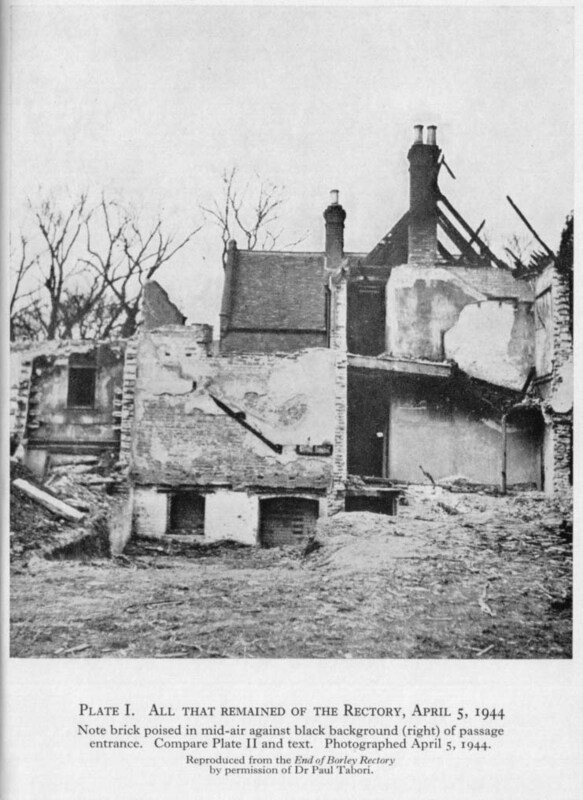 On April 5, 1944, I visited Borley in order to inspect the demolition work for myself. One reason why I went was because I had been asked by Life, the famous American pictorial magazine, to do an article, 'Haunted England'. For illustrating this article, the London editor required photographs of various alleged haunted houses, including Borley Rectory. So on the date I have mentioned Mr David E. Scherman, the Life photographer (and an accredited war correspondent to the United States Army); Miss Cynthia Ledsham, the researcher and archivist attached to Time and Life Ltd., publishers of Life; and I, all journeyed by car to Borley in order to take the pictures. Fortunately, it was a sunny day, and how successful our trip was can be judged by Mr Scherman's magnificent photographs reproduced in this volume. Well, I must say I had a shock - or more accurately, we had a shock - when I saw the rapidly dwindling ruins: only the back portion of the house (leading to the kitchen quarters) was standing. The cellars (they can be seen in the left foreground of the photograph I reproduce ... [Plate I]) were open to the sky where they had not been filled in, and the wreckage of this large - if ugly - Rectory was pathetic to behold. However, Mr Scherman photographed what was left of the ruins, because that is what we were there for. But we were disappointed that demolition work was so far advanced. hundred feet away from them, as the lens he was using was not a very wide-angled one. Miss Ledsham and I stood by his side, watching the proceedings. 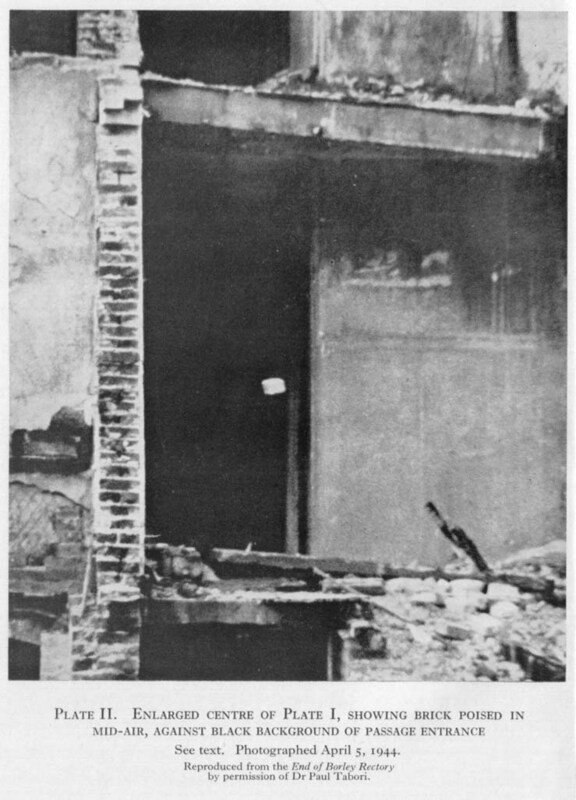 As Mr Scherman pressed the trigger which operated the shutter mechanism of his camera lens a brick, or part of a brick, suddenly shot up about four feet into the air in front of what remained of the kitchen passage, just below the bathroom passage. The three of us saw it, and, as I said, we were at least a hundred feet away from it. We all laughed and called it 'the last phenomenon', and said the Poltergeists were 'demonstrating' in honour of our visit. We walked over to the passage, where there were many bricks lying about. I picked up several, and all appeared normal. No string or wire was attached to any of them, and we saw no workmen at all on that side of the Rectory. As I say, the incident puzzled us, and I personally soon forgot about it. A few days later Mr Scherman sent me the proofs of the photographs he had taken. They were in the form of small contact prints from the original negatives, two and a quarter inches square. The pictures were perfect, and I complimented Mr Scherman upon his skill. Then, on the telephone, he asked me if I had noticed anything about the photograph of the ruins. I said no, and he then pointed out that against the dark background of the passage could be seen a tiny white pin-point. It was the brick! Without knowing it at the time, Mr Scherman opened his shutter at the fraction of a second when the brick was poised in mid air. In proof of what a rapid exposure he gave the picture, there is no sign of movement of the brick in the photograph. For the purpose of illustrating this book, Mr Scherman kindly sent me ten-inch-by-eight-inch enlargements of his photographs, and, of course, in the picture of the ruins [Plate I] can be seen the whitish brick against the black background of the kitchen passage. At my suggestion, Mr Scherman sent my a very much enlarged picture of the 'flying brick' (which I reproduce as [Plate II] and the passage against which it was photographed. The rectangular shape of the brick is plainly visible. More important, it can be clearly seen that nothing is attached to the brick. By the way, none of the pictures taken by Mr Scherman has been retouched in any way, and this applies to every photograph in the book. It is worth noting that the place where the brick suddenly shot up was formerly part of the kitchen passage - focus of many phenomena, and on the walls of which appeared at least two 'messages'. One of them was 'Marianne- Light-Mass-Prayers'. And in the kitchen passage (see Plan II) was the door leading to the sewing room, in which many manifestations occurred both before and after the fire. It is interesting that the brick should have been levitated at this precise spot. If, indeed, this was a genuine paranormal phenomenon, then we have the first photograph ever taken of a Poltergeist projectile in flight. and perhaps thought-provoking coincidence of little value other than as a piece of light relief in a book obviously intended for popular reading. Nor is the situaton changed so far as the public is concerned by Price's letter to Dr Dingwall, quoted on p. 163 of HBR in which he says, 'The only possible explanation would be that the brick was thrown from a long distance, which we did not see, and then it bounced, which we did see'. If this letter suggests anything at all it suggests that privately Price was inclined to believe that the incident might have been paranormal. This is an opinion he could quite sincerely have held. It is not only curious that the incident happened precisely when the shutter of the camera was released; it is also curious that it happened precisely where a number of other phenomena are alleged to have happened before. Although the authors have quoted Price's letter to Dr Dingwall, they do not discuss these rather obvious conclusions from his words. Instead, they challenge the accuracy of his reporting. As I told you at our first meeting about a year ago, I had first hand experience of the most bare-faced hocus pocus on the part of the late Harry Price. In April 1944 Mr David Scherman and I were escorted down to Borley by Harry Price. Mr Price's version of what occurred appears on page 284 of `The End of Borley Rectory'. He refers to a mysterious 'flying brick', photographed by Mr Scherman. As Mr Price pointed out, there were no strings, no wire attached, but what he failed to mention is that there was a brawny workman still at work behind the wall. All three of us saw him as we passed the house towards the spot where the photograph was taken. There is no doubt at all that the flying bricks, several of which came out at regular intervals, were propelled by this workman as part of his demolition work. There are some important differences between Price's story and that told by Miss Ledsham. Let us enumerate them. 1. Price speaks of only one brick. Miss Ledsham speaks of several bricks. 2. Price says the brick rose up from the ground. Miss Ledsham says the bricks came out at regular intervals from behind a wall. towards the place from which the photograph was taken. Miss Ledsham does not say what wall. If we consult the photograph (Plate II) we shall see that the difference between the two stories is fundamental so far as the direction of the brick's movement is concerned. The photograph shews a pile of bricks on the ground at the right hand side of the picture. Miss Ledsham is saying in effect that bricks were being thrown out - i.e. laterally and downwards - on to this pile. Price is saying just the opposite. He is saying in effect that one of the bricks already on the ground was seen to rise up. Miss Ledsham (now Mrs Thompson) was interviewed by Mrs Goldney on 17/10/1950. The following are Mrs Goldney's notes of the interview (S.P.R. files). I asked Mrs Thompson to lunch today, October 17th 1950, in order to get her to sign a statement, repeating her description to Dr West, that when the brick was thrown up, as described on page 289 of `The End of Borley Rectory', workmen were on the spot and there is no doubt at all that the bricks were normally thrown up by them. They (i.e. the reporters and Mr Price) spoke to the workmen at the time. Mrs Cynthia Thompson, correspondent on (American) Time magazine (London Bureau) was then Miss Cynthia Ledsham, and at that time on staff of Life magazine (same management). They saw some reference in newspapers to Harry Price and Borley, contacted him, and were invited to accompany him there. Borley was then in process of demolition. Workmen were on the job when they arrived. Photographs (i.e. of the ruins) were taken. Mrs Thompson remembers that as bricks were thrown up by workmen concealed behind a wall, she jokingly said 'Look, poltergeists'. H.P. apparently joined in the joke, walked up and picked up the brick and said with a large smile 'Yes, indeed; look; no strings, no wires attached'. Mrs Thompson took this as so obviously a joke that she was subsequently astounded to see the form the story took on page 284 of The End of Borley Rectory. She met Dr West (i.e. at a later date) and wrote to him about this (undated letter); and is now giving me copies of the letter (she shewed me her own carbon copy to-day) together with a signed covering note. Her original letter to Dr West was subsequently found and is attached herewith. On the occasion she visited Borley as described above, she was accompanied by a photographer colleague Mr David E. Scherman, now in America. (Signed) K. M. Goldney - at lunch with Mrs Thompson for purpose of obtaining this statement. These notes have been hastily written down during lunch. 17/10/50. Mrs Goldney has read me this statement and I confirm that the contents are true. (Signed) Cynthia Thompson. In virtually every respect it is possible to conceive, this interview failed to do what was needed. Mrs Thompson was not questioned about the differences between her story and Price's story. She was not asked questions that would have enabled her story to be tested. And worse still, she was allowed to alter details of her story in a way that leads to inconsistency which Mrs Goldney evidently did not notice. In the first paragraph of Mrs Goldney's notes it will be seen that Mrs Thompson now speaks of workmen in the plural, whereas in her earlier statement only one workman had been mentioned. Further and much more important, she now speaks of the brick or bricks being thrown 'up', which is also new. This is not just a slip of the pen, for it occurs three times in Mrs Goldney's notes. And it is very puzzling. For if the brick or bricks had been thrown up they could not have been thrown to the position seen in the photograph by a workman or workmen standing behind a wall! The workmen would have had to be in the cellar and would not therefore have been seen by members of the party, as they walked to the spot from which the photograph was taken. Mrs Thompson's memory was not tested by asking her to indicate on a scale plan of the Rectory (a) the point at which the workman or workmen were alleged to be standing when they supposedly threw the brick, and (b) the route by which the party had walked towards the place from which the photograph was taken. It is not easy to find a point on the plan from which a workman could have thrown a brick to the point at which it is seen in the photograph, and yet be invisible from the point at which the photograph was taken, but at the same time be visible from some point along the route by which the party had approached that point. It would have provided a useful test of Mrs Thompson's memory if she had been able to indicate these points on the plan without hesitation or preliminary trial and error. It would have helped us to decide whether the recollections she claims were those of particular events, and not just general recollections of workmen, bricks and demolition work that was taking place at the time. workman's position it is impossible for us to form any opinion as to whether a workman in that position could genuinely have escaped Price's notice. Another question Mrs Thompson was not asked was whether she believed that paranormal phenomena were possible. That is an important question because some people are prone unconsciously to distort evidence concerning matters which they believe a priori to be impossible. Judging from their reply to Michael Coleman (Journal S.P.R., June 1956) it does not appear that the authors appreciated this difficulty. They wrote: 'If Mrs Thompson was privileged to witness the paranormal levitation of a 3½lb. brick at Borley, what possible motive can be suggested for her statement that it was thrown by a workman during the demolition of the Rectory?'. Such a reply, coming from psychical researchers of experience, leaves one rather nonplussed. Thus written, the words carry a stronger suggestion of paranormality than Price did in fact make. To sum up. Price has nowhere claimed that the brick incident was paranormal. Whether or not the brick was thrown by a workman is, therefore, of comparatively minor importance. Even if we assume that the brick was thrown by a workman, there is no evidence to show that Price would necessarily have been aware of it. Without such evidence the authors' charge of 'flagrant misrepresentation' is not substantiated.